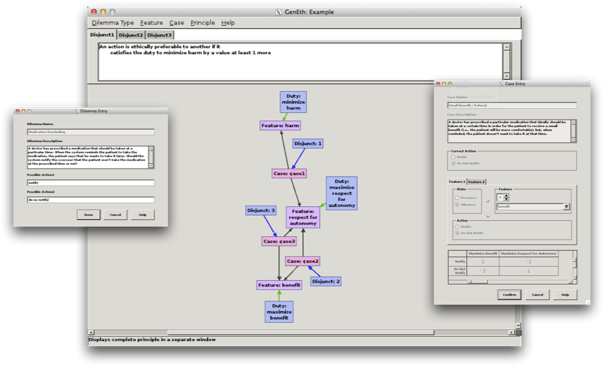 The software was developed using Allegro Common Lisp by Michael and Susan Leigh Anderson with support from their respective universities (University of Hartford and University of Connecticut) and from the National Science Foundation under grants numbers IIS-0500133 and IIS-1151305. Regarding Allegro CL and Franz, Michael Anderson comments, "I must say, you guys are remarkable - you never left me hanging. And because of that, the software has seen the light of day. I have already sought rounds of applause for Allegro Common Lisp in each of the presentation/demos I have made regarding it, and I will continue to do so! Thanks for all your knowledge, patience, perseverance, careful explanations, bug fixes, documentation upgrades, and most of all, your interest! I will forever sing your praises!" The system is freely downloadable, currently for Mac OS X systems only. For more information about and to download GenEth, please see GenEth.html.